C 959 is an all purpose aluminum bronze alloy. The high hardness level of 959 Bronze brings with it exceptional wear resistance properties. Aluminum bronze 959 makes an excellent heavy duty bearing alloy. However, it does not do well in applications where lubricants can become dirty or where misalignment of parts can be an issue. 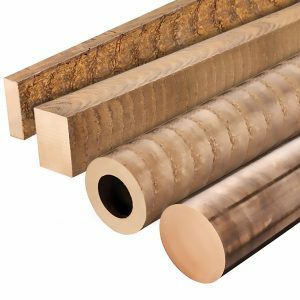 Aluminum bronze is an excellent option for bearings, bushings, and other applications where abrasion resistance and high strength are required. Typically used as bearings, gears, valves, and wear strips/plates. Continuous Cast Bronze Products (932, 954, & 959) are cast over-sized to allow for finish machining. When used for shafts and bearings it is considered best practice to have both shaft and bearing parts machined to a fine surface finish.